The Special Economic Zone Authority in Duqm (SEZAD) signed on August 30, 2017 an agreement with Boskalis Westminster (Oman) LLC for the construction of the liquid Bulk Berth Project at Duqm Port at a cost of OMR 199.1 million Riyals. The new agreement prepares Duqm Port to export liquid refined products and enhance its value in national economy. H.E. Yahya bin Said bin Abdullah Al-Jabri, Chairperson of SEZAD, signed the agreement on behalf of SEZAD and Mr. Neil Haworth, General Manager, on behalf of Boskalis Westminster (Oman) LLC. 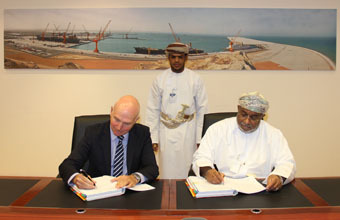 According to the Agreement, Boskalis Westminster (Oman) LLC will carry out detailed engineering designs, construction of marine infrastructure, and dredging and reclamation works, while Worley Parsons Engineering will oversee the engineering and construction works of the project scheduled to be ready within 32 months from the date of awarding. The execution of the project shall be through a unified team of specialists from SEZAD, Worley Parsons Company, and Duqm Refinery Company. Under the Agreement, 2.4 km of the 4.6 km of secondary wave breakwater will be developed and reclaimed for the construction of the liquid quay, and the dual berth marina will be constructed with accessories and navigation equipment. The Agreement works also include excavation of about 26 million cubic meters of material for the works of deepening the basin and track channel at the port, which leads to the liquid dock to reach 18 meters. About 5 million cubic meters of these materials shall be used to reclaim and fill the site dedicated to the quay. The Agreement also provides for the construction of the quay wall of 1 kilometer and installation of buoys and navigational aids devices. After completion of the project, oil tanks and warehouses for bulk materials and facilities will be built by Duqm Refinery, on the reclaimed land area to export refined products from Duqm Refinery and Petrochemical Industries Area. Examples of refined products to be handled at the Berth shall be naphtha, jet fuel, diesel, High Sulfur Fuel Oil (HSFO) and liquefied petroleum gas, coke and sulfur. Duqm Port is currently witnessing the implementation of a number of infrastructure projects, including the establishment of commercial terminal of commercial quay, which includes the construction of roads and commercial gateway of commercial dock, inspection area, trucks registration building, Port single-window building, customs building and other buildings related to the clearing work of commercial terminal. The Port also witnesses the construction of the commercial quay for the collection of containers and construction of buildings and workshops for the operation of the dock, cranes and service roads on the dock, in addition to the infrastructure of the government berth, the first integrated berth implemented in the Omani ports to serve government agencies. Duqm Port has a unique geographical location close to the international shipping lines and African and Asian markets. It has also an advanced infrastructure. The total length of breakwater is about 8.7 km. The depth of the Port basin is 18 meters and the entry channel is 19 meters. This would qualify the Port to receive and handle giant container vessels.